President Donald Trump has ordered a comprehensive review of the H-1B visa program, the primary way that companies in the United States hire high-skilled foreign workers. The multiagency review is expected to result in suggested changes to ensure that the most skilled and highest-paid applicants receive H-1B visas. Though the order may be the first step in an overhaul of the program, only a handful of changes have been made for now to the way H-1B visas are awarded. Almost 1.8 million H-1B visas have been distributed in fiscal years 2001 through 2015, according to a Pew Research Center analysis of government data. The program, created by the Immigration Act of 1990, allows employers to hire foreigners to work on a temporary basis in jobs that require highly specialized knowledge and a bachelor’s degree or higher. Visas are awarded to employers on a first-come, first-served basis, with applications accepted each year beginning in April. If the number of applications exceeds an annual cap set by Congress during the first five business days of April, visas are awarded through a lottery system. Here are some key facts about the current H-1B visa program. 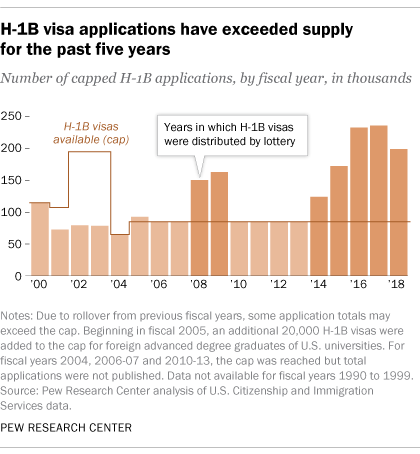 1Since 2005, H-1B visas have been capped at 65,000 a year, plus an additional 20,000 visas for foreigners with a graduate degree from a U.S. academic institution. Congress sets the annual cap, which has varied from a low of 65,000 (first set in fiscal 1990) to a high of 195,000 in 2002 and 2003. Currently, employers submit applications and pay between $1,710 and $6,460 in fees for each visa, depending on the employer’s size – a portion of which funds the National Science Foundation and the retraining of American workers through the Department of Labor’s Employment and Training Administration. 2Demand for H-1B workers has boomed in recent years. In each of the past five years, the H-1B visa cap has been reached within a week of the application period opening. The number of applications rose from 124,000 for fiscal 2014 to 236,000 in 2017, before dropping to 199,000 for fiscal 2018. By contrast, from 2000 to 2013 the visa cap was reached only twice – in 2008 and 2009. 3Universities and colleges, nonprofits and government research institutions are exempted from the cap through the American Competitiveness in the 21st Century Act of 2000. These uncapped employers have accounted for about 10% of H-1B visa applications since fiscal 2010. 4 More than half of all H-1B visas have been awarded to Indian nationals. From fiscal years 2001 to 2015, workers from India received the largest share (50.5%) of all H-1B visas for first-time employment, while the second-largest share went to workers from China (9.7%). Other countries receiving a large share of visas during this time include Canada (3.8%), the Philippines (3.0%) and South Korea (2.8%). 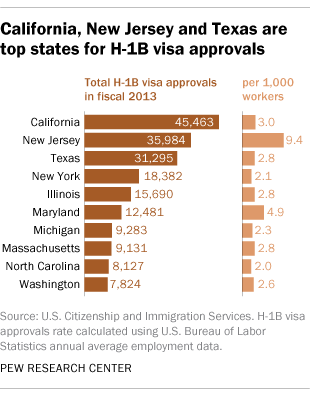 5 More than half of all H-1B visa approvals in fiscal 2013 went to employers in four states. California (17.7%), New Jersey (14.0%), Texas (12.2%) and New York (7.2%) were the top states for H-1B visa approvals, according to the most recently available government data. These states have metro areas that are home to large technology and finance hubs such as San Jose, Dallas, Houston and New York City. New Jersey had 9.4 visa approvals per 1,000 workers, the highest ratio in the nation. Maryland had the second-highest ratio, with 4.9 H-1B approvals per 1,000 workers. 6 About two-thirds (64%) of H-1B visa requests in fiscal 2011 were for occupations in the fields of science, technology, engineering and math (STEM), according to the most recently available government data. 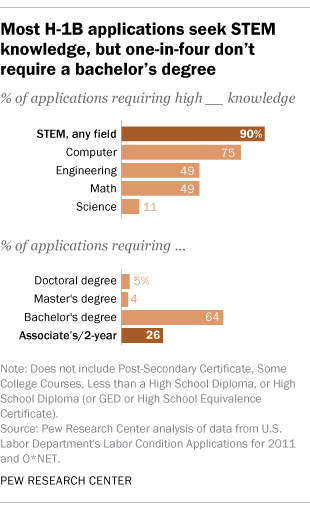 Nine-in-ten H-1B visa requests (90%) are for jobs that require some high-level STEM knowledge. Most H-1B applications (75%) require high-level computer knowledge, and roughly half require significant engineering and math skills. High-level scientific knowledge is less commonly requested. 7One-in-four H-1B visa requests in fiscal 2011 were for occupations commonly staffed by workers with an associate’s degree, despite a requirement that applicants work in jobs that require a bachelor’s degree or higher. By far the most common H-1B occupation that does not require a bachelor’s degree is “computer systems analyst,” with 94% of such jobs requiring less than a bachelor’s degree, according to the most recently available government data. Other jobs that often require less than a bachelor’s degree include operations managers and nurses. Fashion models received an education exception from Congress and are also eligible for H-1B visas. Neil G. Ruiz is associate director of global migration and demography at Pew Research Center. 4 paths highly educated immigrants take to study and work in the U.S.